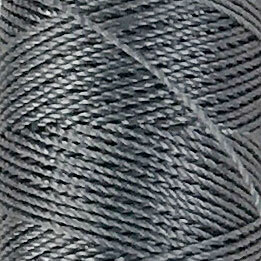 The new C-Lon® Fine Weight Bead Cord Tex 135 was added to the C-Lon family in 2010. As its siblings, the C-Lon Bead Cord (standard weight), the C-Lon Micro Cord (extra fine weight) and the C-Lon Tex 400 Bead Cord (heavy weight), it is a bonded 3 ply twisted multi-filament thread Tex 135 with diameter of 0.4mm and a 24 lb breaking strength. 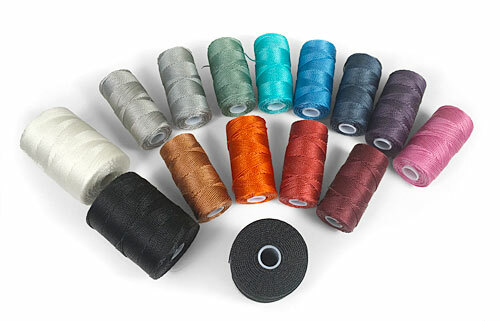 It can be used for micro macrame, stringing beads and other techniques such as bead crochet, finger weaving, kumihimo, tatting as well as many other uses where a strong bonded nylon is required. It is an especially good size for fine beads, for crochet ropes and kumihimo with seed beads size 8/0 and smaller. Production of this size of C-Lon Bead Cordis is shifting to 50 yard spools, allowing more color to be made in this size. 16 colors have been added in 2017-2018. During the transition, some of the colors are only available in the older larger 136 yd spools, other are available in both spool sizes, and some including the 16 newest colors are only available in the newer 50 yd spools. Black and White will continue to be available in both the 136 yd spools and the 50 yd spools. Personal Note - A welcome addition to the C-Lon line. It is a great size to work with when the standard size of C-Lon Bead Cord is too big, and C-Lon Micro Cord too thin. For BK & WH + AM, BR, BE, BR, CR, CO, CST, CT, EGG, FG, FX, G, GP, GR, GY, K, L, LB, LC, N, O, OL, PER, PK, PU, R, RS, SE, SI, SLV, SR, SS. List color code and # of spools if > 1. For BK & WH + AB, ARG, BE, C, CB, CEL, CHA, CHO, CO, CPR, CST, FL, GM, GO, GP, GR, IB, IND, LB, LO, MB, MG, N, NK, NT, OG, OY, PU, S, SG, TL, TQ, VA, VR, WN . List colors and # of spools if > 1. Use color codes only, full names will not fit.